A strong operator on the international markets, Macring Group manufactures profiling and cutting lines and rain water systems. In addition to hardware, Macring’s machines include intelligent software supplied to Macring by Vertex. To guarantee high quality solutions, machines and production lines for all special needs, deliveries are tailored in accordance with customers’ needs. Macring Group was established at the beginning of 2010 when Macring Oy joined forces with Macring Tools Oy and Finprofile Ltd from Ukraine became a part of the group through acquisition. The company employs nearly 130 steel sheet professionals. Macring’s plants in Piikkiö, Finland and Ukraine manufacture steel sheet lines, cutting lines and manufacturing lines for rain water systems. As part of Macring’s structural panel line, customers are provided with Vertex BD 3D software that they can use for the architectural and structural planning of their range of houses. Based on the house model, Vertex BD software produces the manufacturing details for the steel profiles which are then transferred directly to Macring’s production line for manufacture. In addition, Vertex 3D building design provides all wall-specific panel drawings, including parts lists, for the assembly of panels and construction of the house. In other words, together with Vertex, Macring is able to offer its customers a comprehensive solution with which a construction process can be implemented smoothly from architectural design into a finished house. 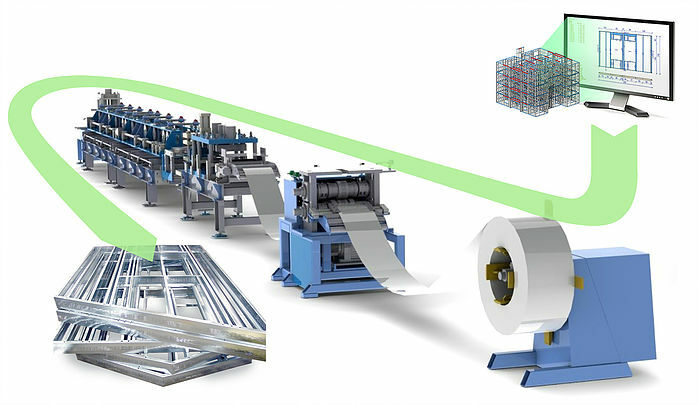 Since paper design drawings are no longer necessary when working with profiles, human errors are decreased when manufacturing details are produced automatically onto the line. Approximately 90 per cent of Macring’s production is exported and the company has a strong foothold on the international market. Key export destinations include Russia, Scandinavia and Eastern Europe. “Wood is still a popular construction material in Finland but in countries where good-quality wood is not available, steel construction is strong. Steel profiles are precise in their measurements, they will not burn or become moldy. In addition, steel construction has its advantages when building in earthquake areas,” explains Kärpijoki. Established in 2004 and operating in Krasnoyarsk, Siberia, Modern Building Technologies (MBT) employs a staff of approximately 50. The company has its own dry product factory that produces dry m ix and plaster products. In addition, MBT has a paint factory based on German technology. The company has most recently entered into the steel industry. “When we were searching for a suitable manufacturing line for structural steel panels, we found that basic lines were up against so-called smart lines. Macring caught our attention at an exhibition where we were able to become acquainted with a ready CU production line,” explains Vladimir Shubin, Factory Director. “Macring’s option was attractive because of its flexibility. The widths and heights of profiles can be adjusted and pipings and lines can be integrated in the structures. In addition, short setting adjustment times and the line’s expandability were notable advantages. Moreover, combined with design software, the line represents the future. In short, this is a functioning entity,” says Juri Galkin, Manufacturing Line Operator. Alongside the CU production line that utilizes Rosette technology, MBT will be using versatile Vertex which was introduced to the company during the planning phase of the production line. In addition to a Vertex license, the production line package includes a five-day training session on architectural design and structural planning. “The extent of the training was quite challenging for us, because Vertex BD includes basically all the tools for architectural and structural design. Practical experience will surely teach us more. And luckily, the Vertex package includes technical support for a year,” states Anatoly Bykov, Head Designer, who is currently the only one using Vertex at MBT. The company plans to either employ new talent or train current staff members to use Vertex in the future. According to estimates, MBT’s new CU production line will be operational in April. The line has also added to MBT’s ambitious goals: the company is now seeking the position of market leader in steel construction in the Krasnoyarsk area. “The construction industry is very competitive in Siberia. We believe the new line will decrease production costs and thereby improve our competitive position. The crisis in Europe is not particularly visible in Siberia and there seem to be construction projects open for competition,” Shubin explains. Conditions in Siberia set challenges for construction. In Krasnoyarsk, for example, thermal insulation in buildings must be designed to function at an average temperature of -40–50 °C. In addition, during an ordinary winter, buildings are estimated to accumulate a snow load of 180 –250kg/m.